That’s (almost) a wrap for CES 2015. Another consumer electronics bonanza come and gone, and for a quick minute here, tech watchers think they know what’s around the corner. That is until they look at past CES Best in Show winners, like the Creative Zen Vision M player (2005), the Palm Pre (2009), and the ho-hum LCD / LED / 3-D television sets that took home hardware at recent shows. Perhaps nobody really goes to CES to try and see the future. Just like any tradeshow, it’s a see-and-be-seen affair, and all the barking and hype is an essential and inseparable part of it. It’s what makes it fun. Here we will look at five of the most egregious overstatements from the 2015 installment of CES. Get your earplugs ready. 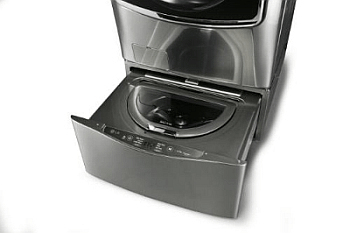 The LG TWIN Wash System allows consumers to do two loads of laundry at once, thanks to a drawer-like washer beneath the main front-loading machine. While it does look useful for knocking out a load of delicates with the heavy cottons spinning in the main chamber, whether it is “crazy” is a stretch. You’re still doing laundry no matter how many washers you cram into the chassis. Crazy is when you overstuff your top-loader and it starts walking across the basement. It takes some belief-suspending whenever anyone says their kids—Shapiro’s are ages 6 and 2—are not allowed to watch TV. The quote came at the “Digital Detox” seminar aimed at encouraging people to unplug from electronics. It’s like someone throws the biggest keg party in the world, and comes out and starts teetotaling right in the middle of it. The Huffington Post headline proclaimed the “big new trend in tech might be… not using it any more.” I won’t hold my breath for that trend to emerge—unless they’re talking about hipsters toting around Sony Walkmans ironically. 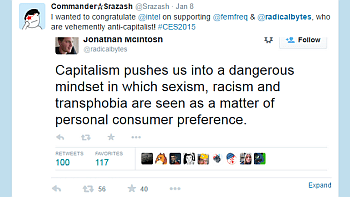 Now isn’t the time to delve too deeply into the merits of the GamerGate social media shouting match, which spilled into CES 2015 when Intel announced its partnership with Feminist Frequency as part of its $300 million program to engage women and minorities in tech. No matter where you side on GamerGate, you’ve got to feel like the rift in the tech community has deepened as a result of the geek-yelling. The loudest of the bunch have forgotten that most of us play games to get away from people. Thync is a wearable that attaches to your temple and behind your ear. By delivering electronic pulses to you brain, Thync supposedly alters your mental state. The prototype has two settings: “energized” and “calm”—tech blogger Molly McHugh felt “tingles” in her brain in the energized setting, but she couldn’t tell whether it was the Thync or the placebo effect, or perhaps it was the coffee she was mainlining that morning. Hippies use minerals and crystals (and special chemicals) to the same effect; it makes sense that techies would develop a gadget for it. Disrupt is one of those buzzwords tech CEOs love to throw around, and John Chambers delivered a three-hit combo at the Cisco keynote. He also touched on data-driven decision-making in the age of the Internet of Things, and proclaimed that soon every business vertical will be forced to embrace the digital revolution. He went on to expound that only 40 percent of companies today will exist in a meaningful way in 10 years. Definitely sounds like a mission-critical situation. Let us know in the comments—what were your favorite moments (or exaggerations) of CES 2015? CES 2015: It’s a see-and-be-seen affair, and all the barking and hype is an inseparable part of it. Here are the best overstatements from this year's show.